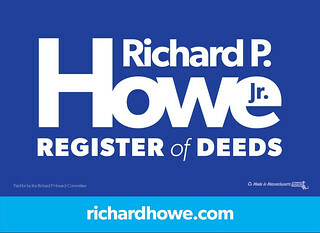 Will you help my reelection campaign by placing a Richard P. Howe Jr. for Register of Deeds sign in your yard? If you live in one of the following towns and can help with a sign location, please call or text me at (978) 387-8302 or send an email or fill out this form. The Middlesex Community College Academic Arts Center, formerly known as the Boston & Maine Building and then the Rialto Building, is rapidly nearing completion and will open for students this September. Earlier this week I took a tour of the interior which disclosed an amazing transformation of a historic structure whose continued existence was once in doubt. Architecturally, a brand new building within the building has been constructed. 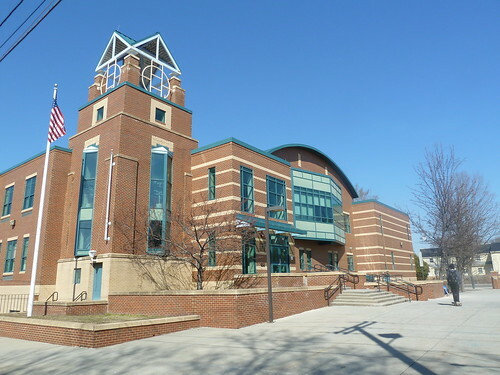 Referred to as “the egg,” this oblong-shaped interior structure contains a 187-seat theater on the first and basement levels, a 101-seat recital hall on the upper level, and a 900-square-foot dance studio also on the upper level. All are outfitted with the latest in technology for sound, lighting and audiovisual. 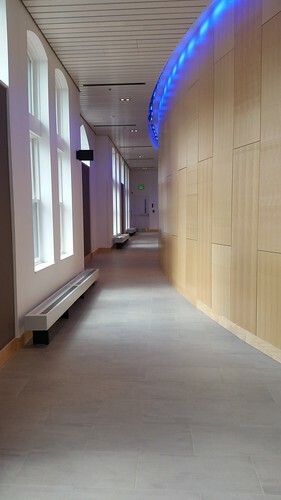 Between the interior “egg” and the exterior brick walls sit an entrance lobby, two music practice rooms, two classrooms, dressing rooms, and several faculty offices. The focus in September will be situating the faculty and students of the school’s performing arts program in the new facility. Eventually, the Academic Arts Center will host community programming and may even be available for rent to third parties. When it comes to performances and programs open to the public, we will inevitably hear a “where’s the parking?” groan from some in the city. But the fact is that the Early Parking Garage and the Lower Locks Parking Garage are on either side of the Academic Arts Center, just a short walk away. (Granted, the adjacent Gorham-Central-Middlesex-Green intersection is a tough one for pedestrians to cross, but the opening of this building should cause the city to take additional steps to make that area safer and more convenient for pedestrians to navigate). We are all very fortunate that so many entities – Middlesex Community College, the Commonwealth of Massachusetts, Lowell National Historical Park, the city of Lowell and others – have stepped up to preserve this historic building. As the saying goes, “it ain’t cheap” but it’s hard to put a price tag on preserving an important part of our city’s history. 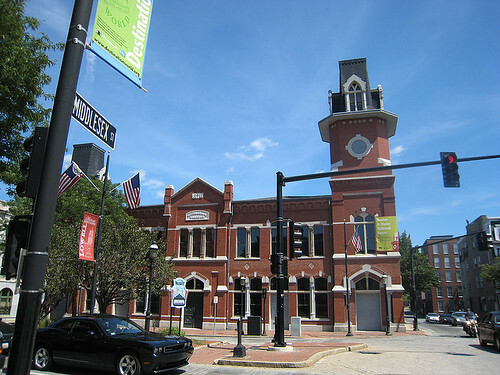 Constructed in 1876, this building was first used as the passenger and freight depot of the Boston & Maine Railroad. Shortly after that, the city’s first telephone exchange was also located on the upper floor. However, when a new train station opened on Middlesex Street in 1895, the railroad moved out of this building. It eventually became a theater. My own memory of the building was as a bowling alley in the late 1960s. For all three uses – train station, theater and bowling alley – there was an adjacent wooden structure on the parking lot now to the rear of the building that housed those functions. For example, I recall entering the main doors on Central Street and proceeding through a long entrance hallway to the bowling shoe pickup desk. Although I didn’t realize it at the time, that long hallway cut through the entirety of the current brick building and brought you into the adjacent structure that no longer exists. I share these details because when you first see the building from the inside today, it quickly becomes apparent that it is not that big of a structure which in turn leads you to wonder how it served as a theater or bowling alley. (It also leaves you impressed by the masterful job the architects and builders did in fitting all of the current uses into the existing structure). So congratulations to everyone involved in this project. I urge readers to take advantage of any opportunities you may have to get inside and see this fine new addition to downtown Lowell. The Lowell School Committee voted this week to conduct a study on the feasibility and consequences of adopting a student assignment model that emphasized assigning students to the school closest to where they live. The term most often used for this strategy is “neighborhood schools” but that phrase carries different meanings to different people and can provoke strong emotions both for and against. While the driving force for this discussion is an effort to reduce the cost of transportation in a school budget that has already been cut significantly, some hear “neighborhood schools” and grow nostalgic for an earlier time when students were able to walk to school in the morning and then after school walk back to a home that had at least one adult present (usually the mom) who could provide free childcare for the balance of the day. For others, “neighborhood schools” carries a negative nostalgia symbolizing a time when more affluent neighborhoods had the best schools and poorer neighborhoods had schools that weren’t as good. Because of historic neighborhood settlement patterns, this approach often yielded schools that were more segregated by race and ethnicity. It was that type of segregation that drove a lawsuit against the city of Lowell in the late 1980s. The plaintiffs were minority-group parents who alleged unequal access to the schools for their children. They had a strong case. With the U.S. District Court on the verge of taking control of the Lowell public schools, the city and the parents reached a settlement that resulted in a “consent decree” regarding school assignment policies. That court decree still stands today and is a factor in the present discussion. One direct result of that consent decree was the Lowell jumped to the front of the Massachusetts School Building Assistance line at a time when new schools received 90 percent funding from the state. Lowell built about 15 of them, transforming the physical plant of the public schools in the city. While these new schools equalized the facilities available in all neighborhoods of the city, they are not necessarily suited to be “neighborhood” schools. 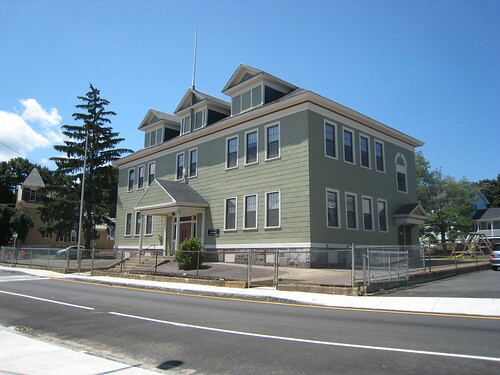 Historically, as neighborhoods were built out in Lowell, the city would construct a new school building in the midst of all the new houses. By the late 1990s, however, that model of school construction did not work because the available lots that were big enough to accommodate a new school were often on the periphery of neighborhoods or not in the neighborhoods at all. Consider the Stoklosa Middle School at Broadway and School streets, the last of the new schools built in Lowell. If you had constructed that school in the midst of the neighborhood most in need of middle school seats, it would be in Pawtucketville, not the Acre. Consequently, even if you assign students who live closest to a school to that school, you still may have to bus many of them because they still live too far away to walk to school. But other factors besides distance from home to school influence the choice parents make on where to send their children to school. The quality or perceived quality of a school is a big factor. I would guess that the schools most in demand by parents of potential students are wanted for their reputation as a provider of quality of education as opposed to the door-to-door distance from the student’s home. Start and end times of school is another factor in the parental decision-making process. With most parents working, the lack of affordable and safe pre- and after-school programs cause many parents to try to match the start and end time of the school their children attend with their own hours of work. Whether the child would walk or ride a bus to that school would seem not to be a factor here. Back in 2010, I wrote in support a blog post in support of neighborhood schools only with some important caveats. My vision would require school buildings to double as neighborhood community centers that were open from early morning until late into the night and on weekends, too. They would offer affordable and high quality before and after school programs, adult education classes, homework help centers, neighborhood athletic programs, computer classes for adults, satellite health clinics and much more. I also believe families are much more likely to become engaged in a child’s education if family members find it convenient to come to the child’s school. If you have to drive across town after dinner to do that, you’re likely to stay home. If you’re able to just walk a few blocks in your own neighborhood, the odds of you going are increased. I still believe that the benefits of this type of neighborhood school would outweigh any harm it might cause to the objectives of the Consent Decree. But I also believe that if you just retain the current model of how schools are utilized and revert to the old way of assigning students, it would collide with the intent of the Consent Decree and likely evade judicial ratification. Since the programs and opportunities my model would provide would also cost a lot of money, I’m not optimistic that they could be easily implemented. 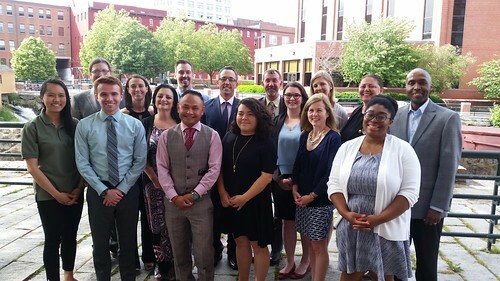 The Public Matters class of 2018 graduated from the program on Wednesday. Public Matters is a joint venture of the Lowell Plan and Lowell National HIstorical Park which seeks to develop civic leaders by immersing students in a six month program on the city’s history and culture and the challenges that it faces today. 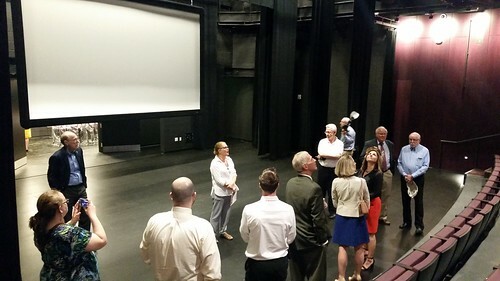 Throughout the program, the class meets with people from government, politics, business, the media and many other fields who all offer insight into how Lowell Works. At other meetings, students take neighborhood tours, go white water rafting on the Concord River and participate in other experiential activities. Anthony Nganga, who was chosen by his classmates to speak at the ceremony on behalf of them all, said that Public Matters was like going to your favorite restaurant and having the chef bring you into the kitchen to show you the behind-the-scenes operation. Besides Anthony, this years Public Matters graduates were Patrick Burns, Hilary Clark, Maria McDuffie Clark, Corinne Corcoran, Andrew Duncan, Michael Fernandes, Tom Fitzmaurice, Christopher Hayes, Robin Licata, Cherry Lim, Leanna Moran, Charles Pappaconstantinou, James Poirier, Laurel Racine, Rose Ruggiero, Laura Santiago, Meghan Siembor and Tooch Van. They join 174 graduates from prior years to give Public Matters a 193-member alumni association. 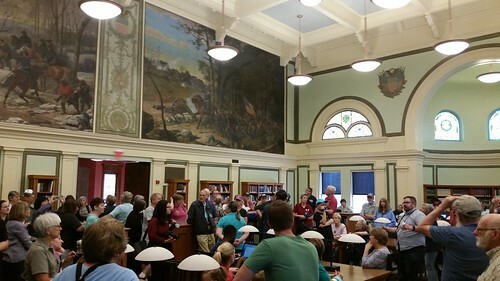 The official kick-off of the 2018 Lowell Walks season happened yesterday with Sean Thibodeau and Kim Zunino leading 109 people on a tour of the inside of Lowell City Hall and of the Pollard Memorial Library. We learned about the controversial design selection process for both buildings (which were built at the same time), construction challenges, how the buildings have evolved over time, and fascinating facts about the design, architecture and inhabitants of each structure. 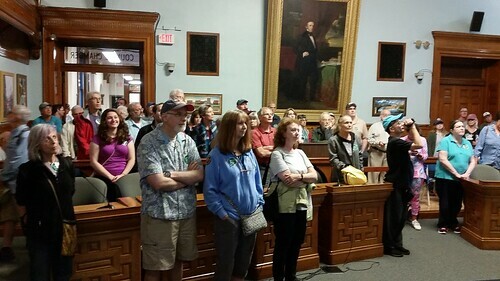 Lowell Walks continues next week with Kerry and Wayne Jenness leading a walk on “Infamous Crimes in Lowell.” The walk will begin on Saturday, June 30, 2018 at 10am at Lowell National Park Visitor Center, 246 Market Street, will last about 90 minutes, and is free to anyone who shows up. Watch for a spike in vehicular and pedestrian traffic in downtown Lowell during this coming week. 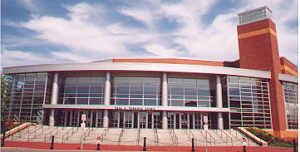 The Congress of Future Medical Leaders and the Congress of Future Science and Technology Leaders will come to the Tsongas Center beginning Monday, June 25 and will continue there through Sunday, July 1, 2018. From past experience, that will mean extra heavy traffic on all approach roads to the arena and lots of business for downtown restaurants. It’s great for the local economy, but plan your own downtown travel and activities accordingly.